The fall of the Berlin Wall more than two decades ago brought an end to the Cold War for most of the world. But the legacy of that era remains unresolved on the divided Korean peninsula, which still presents a clear danger for the United States and its allies. Two triangular alliances—one comprised of the United States, South Korea, and Japan, and the other of Russia, China, and North Korea—lie at the heart of the security challenge and all efforts to pursue a final peace treaty. 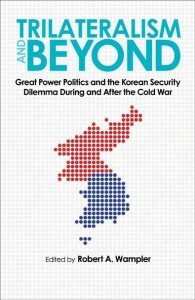 Trilateralism and Beyond brings together a collection of essays by leading American, South Korean, and Japanese scholars that probe the historical dynamics formed and driven by the Korean security dilemma. Drawing on newly declassified documents secured by the National Security Archive’s Korea Project, along with new archival resources in China and former Warsaw Pact countries, the contributors examine the critical relationship between the United States and South Korea, exploring the delicate balancing act of bolstering the security alliance and fostering greater democracy in South Korea. The volume expands its focus to include Japan and a look at the history and future challenges of trilateral security cooperation on the peninsula; impending difficulties for security cooperation between the United States, South Korea, and Japan; and the trials that Russia and China have experienced in dealing with an often demanding, unpredictable ally in North Korea. The authors move beyond simple images of ideological support by the two great powers to draw a more complex and nuanced picture. Trilateralism and Beyond offers an essential historical perspective on one of the most enduring challenges for U.S. foreign policy—ensuring stability on the tumultuous Korean peninsula. EditorRobert A. Wampler is a senior fellow at the National Security Archive, a nonprofit foreign policy research institute based at George Washington University. He is the editor of three declassified document collections, including The United States and Japan: Diplomatic, Security and Economic Relations, 1960–1976 and 1977–1992 and The United States and the Two Koreas, 1969–2000. He also is coeditor of Partnership: The United States and Japan, 1951–2001.